Wear Parts Engineering - Columbia Steel Casting Co., Inc.
Our engineers are always ready to listen to your ideas and concerns, and provide the solutions you need. 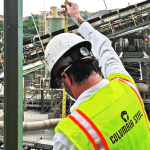 Although Columbia Steel holds numerous patents, most of the innovative design takes place every day as engineers and field representatives work closely with end users to solve specific application problems. Incremental changes in design and optimum alloy selection often lead to significant improvements in the operation of equipment. Carefully studying the situation and identifying the problem or problems is key to developing improved wear parts that meet or exceed or customers’ needs. Columbia engineers study the big picture and understand that any changes in processing equipment must take the entire operation into account. Our field representatives conduct reviews of customer plant design and equipment, material characteristics and performance records, as well as wear parts used. Our product engineers travel to study performance first hand. Recommendations can be as simple as selecting from Columbia’s large inventory of parts, or casting from our vast collection of patterns. Or a modification of an existing product may be in order: in the pattern design; in alloy and/or hardness levels; or by applying high-carbide overlays in our Xtend Process®. The result is replacement wear parts engineered to increase efficiency and reduce downtime. We are the industry leader for dragline chain used in coal and phosphate surface mining. Columbia’s TwistLink® chain is as strong as our standard chain but at up to 22% less weight per strand. TwistLink also offers an increased surface area in the bite region and greater cross-sectional thickness. A customer experienced cracking and breaking in a large OEM-designed mantle for the world’s largest cone crusher. The Columbia solution was to manufacture the mantle in two pieces, precisely along the point of highest stress in the part. This relieved the stress, solving the problem and doubling the wear life of the part. Columbia Steel took a 3-piece nose ring segment for a cement plant kiln and redesigned it into one piece. The resulting advantages included faster installation, easier removal of worn parts, and simplifying stocking and material handling. In addition, the alloy was upgraded to provide greater strength at high temperatures. Our manganese domed nut for a Symons 7-foot cone crusher solved two problems at once. The domed shape replaced a flat plate, allowing slabby rock to break and slide to the side, rather than lay on top of the plate and create blockages and reduced through-put. The manganese steel work hardens and lasts several times longer than the standard plate or plain carbon steel. One large U.S. aggregate producer experienced a 28% increase in their daily tonnage due to this improved part.